Published: June 18, 2012 at 12:26 p.m. Updated: Aug. 4, 2012 at 10:26 p.m.
Steelers QB Ben Roethlisberger has been sacked 314 times in 114 career starts, an average of 2.75 per game. PITTSBURGH -- In the NFL, quarterbacks have the million-dollar arms and the protect-at-all-costs bodies. So in practice, quarterbacks wear red jerseys, ones that scream, "Do not touch!" Except at Pittsburgh Steelers practice. There, there are only white jerseys and black jerseys. And a quarterback who thinks he's a hockey player. 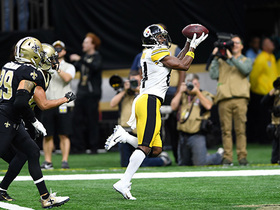 "I don't think we could ever have a -- I don't want to say prissy -- but I don't think we could ever have that style of quarterback here," safety Troy Polamalu said. 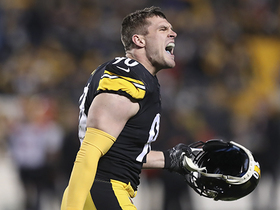 "Ben," safety Ryan Clark said, "is a real football player." Ben, of course, is Ben Roethlisberger, the 6-foot-5, two-time Super Bowl-winning signal caller who, in the ninth year of his career, still doesn't understand the concept of saving his body. Roethlisberger was a regular on the injury report last year. A shot to the knee, a sprained foot, a broken thumb, a high ankle sprain ... On it went, a badge of honor to his teammates -- "He's beat up like everybody else is beat up," Polamalu said -- but a (broken) bone of contention for Steelers president Art Rooney II. Rooney suggested Roethlisberger "tweak" his game back in January, after a beat-up Roethlisberger wasn't at his best both at the end of the season and in an unpleasant, opening-round playoff loss in Denver. So the question this year becomes: Is a smarter, more productive Roethlisberger one who goes down, runs out of bounds and does all those things his mom begs him to? "Oooh," receiver Jerricho Cotchery said. "Um," tight end Heath Miller said. Cotchery hemmed, Miller hawed. Cotchery called it a good question and then said he's glad he's not a coach. Miller chuckled and then said there are plenty of times he watches tape of his quarterback scrambling under, past and just plain over tacklers and says, "What was Ben thinking?" And then both said they wouldn't want a more careful, less reckless Roethlisberger on their football field. Miller said Roethlisberger's toughness trickles through every part of the Steelers' roster. Cotchery said without the hell-bent crazy, Roethlisberger wouldn't be, well, Roethlisberger. 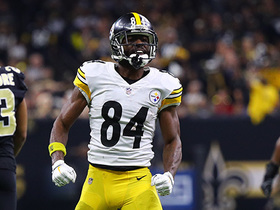 "I think the way Ben plays is what makes him special," Cotchery said. "You never want to take that away." Most quarterbacks, if they get hit enough, see their numbers slide. Swarm them enough, bother them enough, their accuracy slips. Not Roethlisberger. He keeps coming, staying upright after hits that would pancake a lineman. The flip side? Does he really need to be taking hits that would pancake a lineman? "It's just: Don't take hits," Roethlisberger said of his advice to himself. And then, "But I don't know how to do that." "Of course you don't want him to get hurt," Clark said. "You take the good with the bad. That's like me telling Troy, 'Hey Troy, I want you to do exactly what the book says every play.' You take away someone's greatness when you limit what they can do with their athletic ability or their God-given talent." And yet, Clark acknowledged, "We need Ben on the field. We need a healthy Ben Roethlisberger to be a healthy Super Bowl contender." Roethlisberger has been sacked fewer than 40 times in season exactly once in the past six years, in 2010, when he spent the first four games of the year suspended. He's been taken down more than any other quarterback in that span and conventional wisdom says a signal caller that rash with his body gets defensive players salivating. A guy who insists on extending plays extends time to get walloped, right? "No," Ravens nose tackle Haloti Ngata said, shaking his head, smiling politely and yet all the while saying: Take that conventional wisdom under some other center. "That's a hard quarterback to get down. 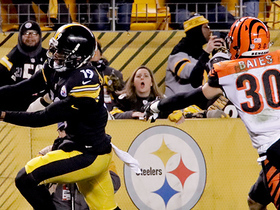 When people actually hit Ben, he's moving in different ways," Ngata said. Right, but all that moving around makes him extra vulnerable. Sure, Eli Manning looks like a goober when he does his slide thing, but a defensive player can't (legally) hit him if he's down. And that caution means the Giants know he'll be there, the next series, the next quarter and the next week. "Yeah, maybe, but that's the thing about Ben," Ngata said. "He's a big guy himself. For DBs, safeties, smaller linebackers -- it probably hurts them more than it hurts him. ... If I was him, I wouldn't change anything." And as far as Roethlisberger is saying now, he won't. In fact, he was almost defiant in promising, "I'm going to play the game the way I know how." So yes, he can be en route to becoming a father later this year. Yes, he can be 30 and find aches don't ease as fast as they did at 20. Yes, his boss can offer a directive, masked as a suggestion. But change? "I don't think I'm prissy."